Learn about Columbus' important role in Texas history. The rich history of Columbus is definitively Texan. From its early days as the site of Montezuma’s village to serving as the base campsite to General Sam Houston and his troops along the banks of the Colorado River during the Texas Revolution to the days of shootouts in the streets and the rise and fall of cattle drives and cotton, Columbus played an important role shaping in Texas’ rugged history. Keeping our heritage alive plays an important role in our way of life. We are proud of our roots and the fact so many of our historical buildings and homes are still around today, open to the public for tours. Columbus also has a large number of historical markers in and around town. There’s history seeping from every corner of this small town. Come and see for yourself! Be sure to bring your camera and comfy shoes. Robert E. Stafford built the Second Empire-style Stafford Opera House in 1886. Originally, it housed the Stafford Bank on the first floor and a flat-floored opera house upstairs. The white two-story house next door was the house Bob Stafford built for his family. 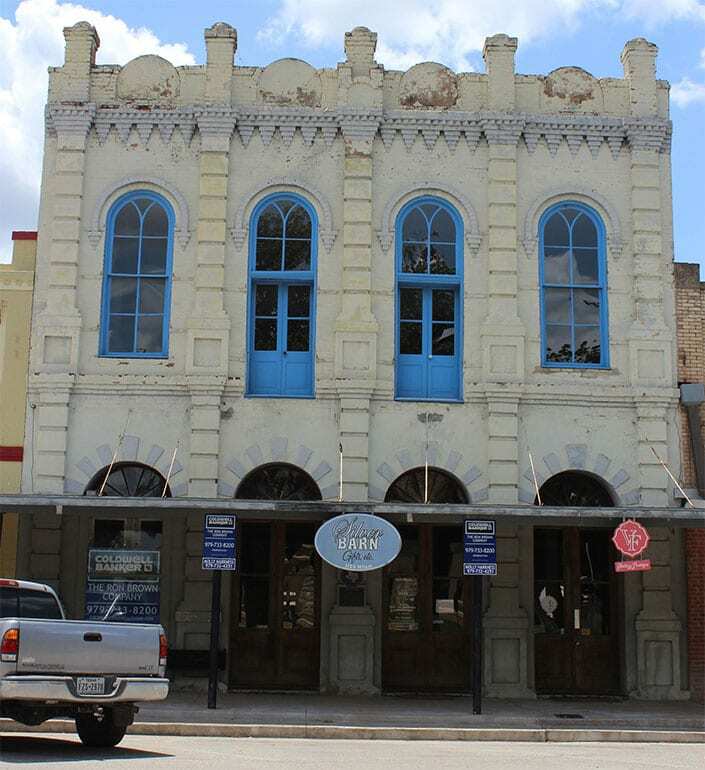 The 1886 Stafford Opera House was listed in the National Register of Historic Places in 1973. Today, the Columbus Historical Preservation Trust, Inc. (CHPT) owns the property and carries on the tradition of presenting live theater and entertainment on the Grand Hall stage. The space is also used for weddings, meetings, conventions, school and church functions, and other events. The present building is the third courthouse to stand on the same site and was built in 1890. It is a combination of Classical Revival and Greek Revival styles. The central bell tower and roof were destroyed in the 1909 storm. Both were replaced with a central domed Tiffany-style skylight. 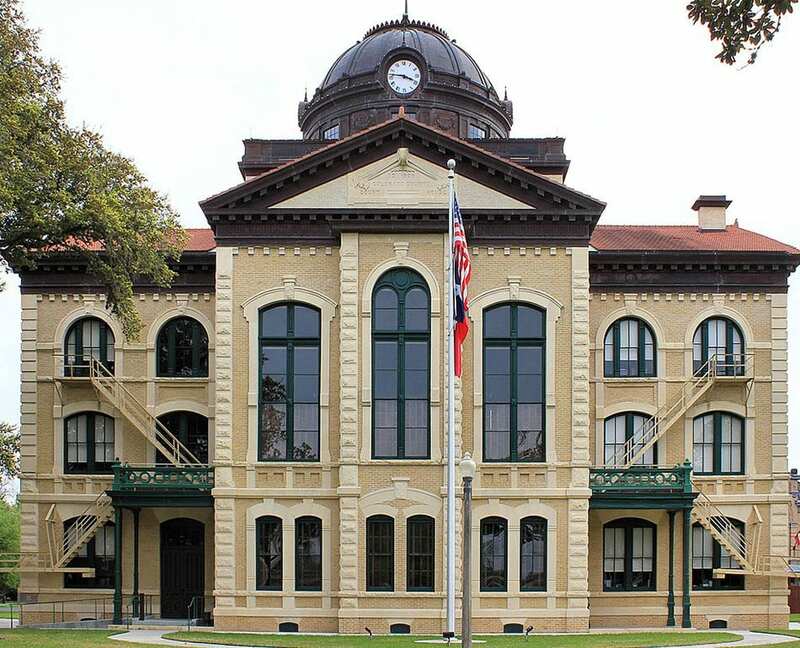 The Courthouse was officially recorded as a Texas Historic Landmark in 1969 and in 1976, it was listed on the National Register of Historic Places. Self-guided tours are available Monday through Friday from 8 a.m. to 5 p.m. 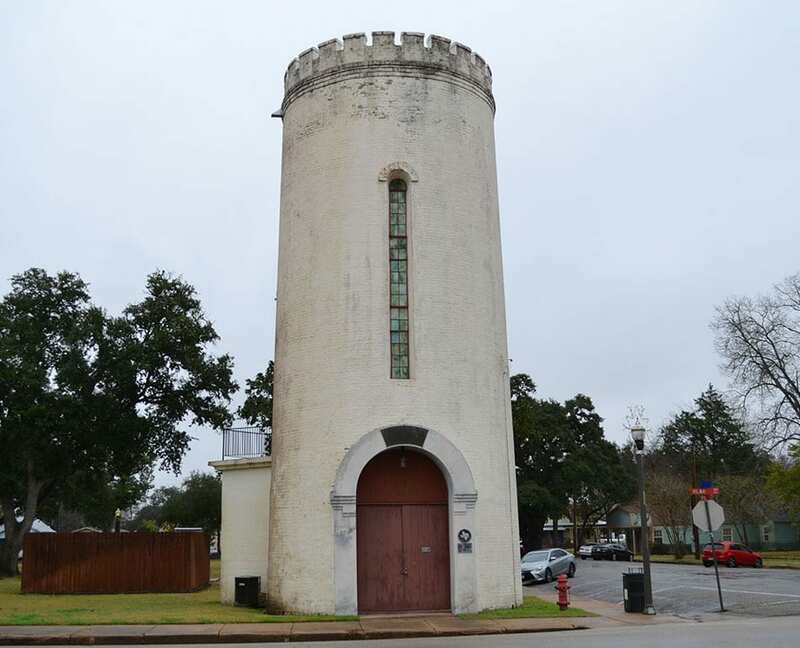 This building was built in 1883 as a water tower and stored the horse-drawn fire engine until 1912. The United Daughters of the Confederacy chapter used it as their meeting hall and converted it to a museum in 1962. The museum is dedicated to Colorado County veterans of all wars and houses local and county history. It includes history of local veterans from the Civil War, Spanish American War, WWI, WWII, Korean War and Vietnam War. Displays include personal and military items and photographs. The second floor displays local and county historical photos and histories, a doll collection, carpentry and cobbler tools and archaeological findings. 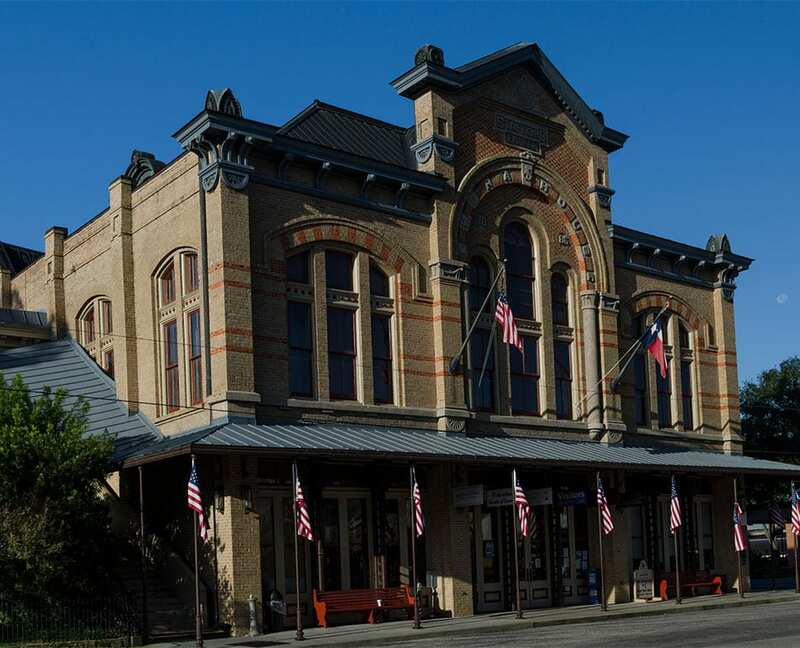 Located at 1120 Milam, Henry M. Ehrenwerth built this two-story commercial structure in 1873 using bricks from a local kiln. Designed for his mercantile store, it housed L.G. Smith’s Red Elk Saloon and Gambling Hall in the 1880s. In 1896 the building was purchased by James Ramsey, who operated a hardware, implement, and undertaking business. Mr. Ramsey’s son, Charles, sold the structure in 1925 to the hardware firm of Leo L., F. J. and Emil E. J. Untermeyer. A carriage step is a block of stone or concrete placed at the street as a courtesy to guests stepping out of carriages and was a symbol of prominent families in the community. 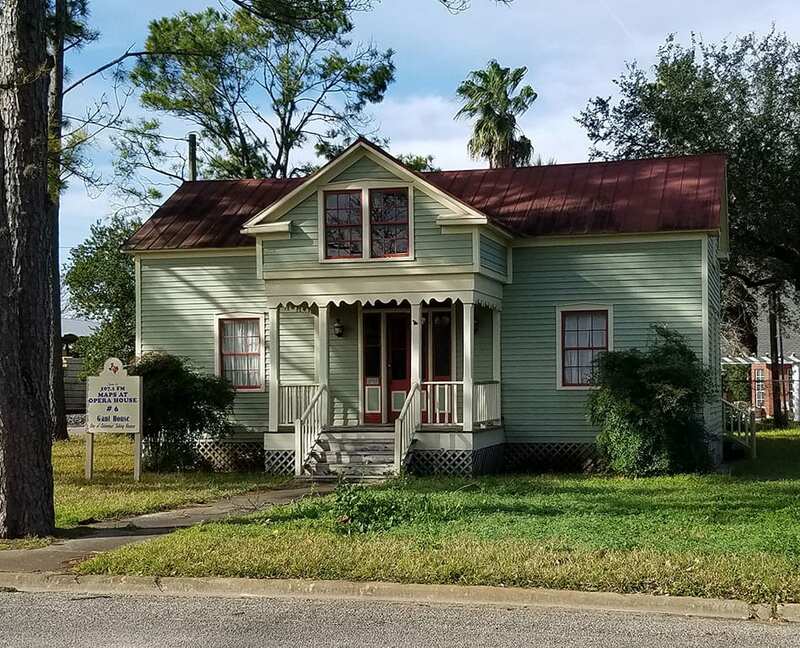 The home was originally built in 1860s of cypress wood by Robert Robson and was sold in 1879 to R. S. Stephens, a railroad purchasing agent, and his wife, Bettie Thatcher. The carriage step at the house is in the original location and is the only known carriage step in Columbus. This charming home now operates as a tea room and bed & breakfast. Dilue Rose was born in Missouri in 1825. She and her family moved to Texas in 1833. Dilue is best known for her book Reminiscences, in which she recounts her journey during the Runaway Scrape. These memoirs are considered an important piece of Texas colonial history. Dilue married Ira Harris in 1839 and they moved to Columbus in 1845. Ira Harris became Sheriff of Colorado County and served for a number of years. They built their modest “tabby” home in 1858 and lived in it with their nine children. Ira died in 1869 and Dilue followed in 1914. Abram Alley was among Stephen F. Austin’s ”Old Three Hundred” colony. Abram immigrated to Texas in the spring of 1822 from his home in St. Genevieve, MO. He traveled by boat to Galveston Island and then traveled by foot to the Atascocita Crossing of the Colorado River. During the Texas Revolution, Gen. Sam Houston gave Abram the responsibility of moving the women and children to safety during the Runaway Scrape. Before leaving, they burned every building to the ground. 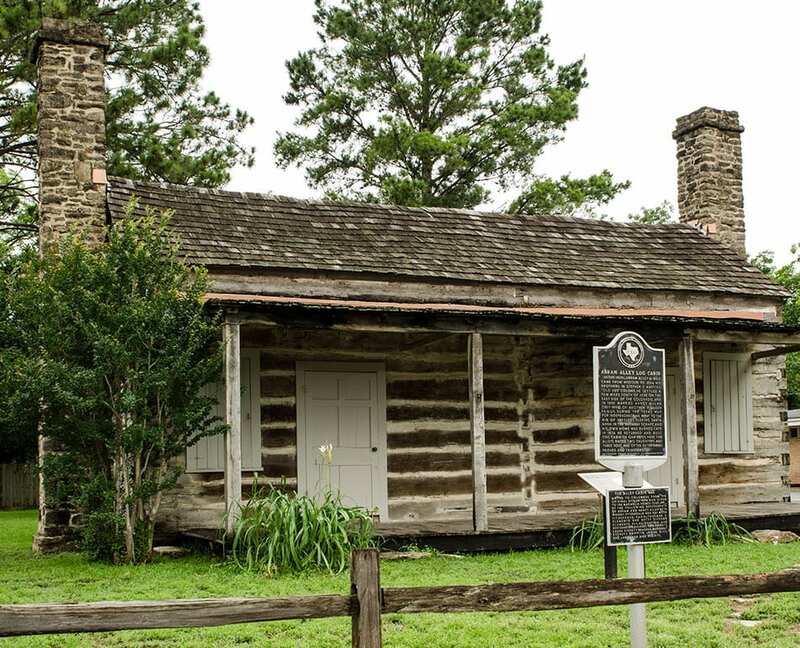 After the defeat of Santa Ana at San Jacinto, Abram and Nancy returned and rebuilt their cabin on the same site. The cabin was moved to the current location in 1976. 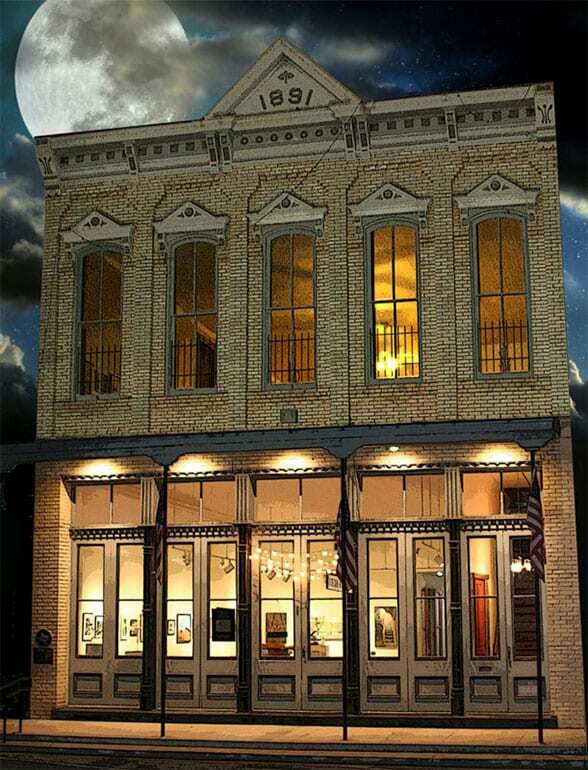 The Brunson building was last used as a saloon in 1919 and is now home to the Live Oak Art Center. This Eastlake-style home was built in 1890 by contractor Jacob Wirtz for Marcus H. and Annie (Burford) Townsend. A state representative from 1883-85 and senator from 1889-93, Mr. Townsend sponsored a bill for Texas to purchase the Alamo. 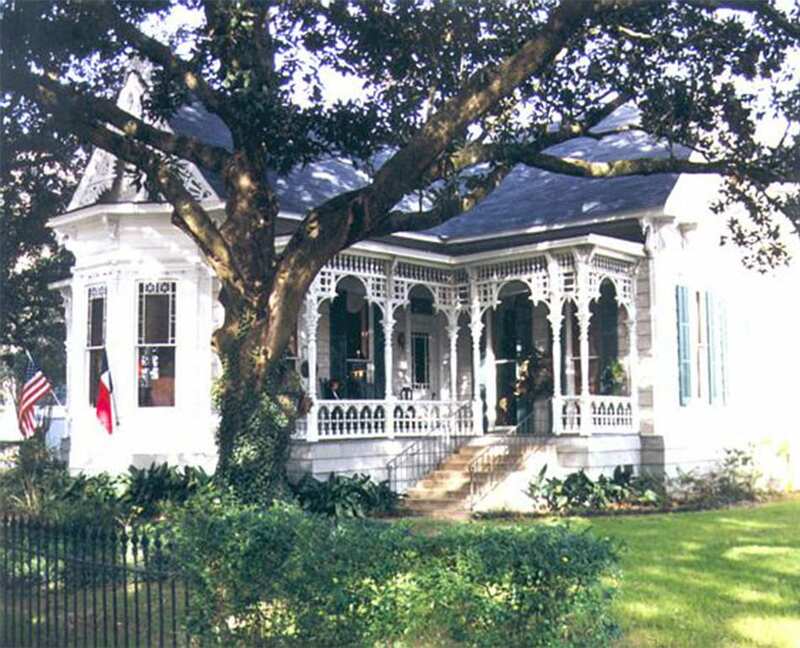 The home was purchased in 1906 by Thurmond and Emma West. 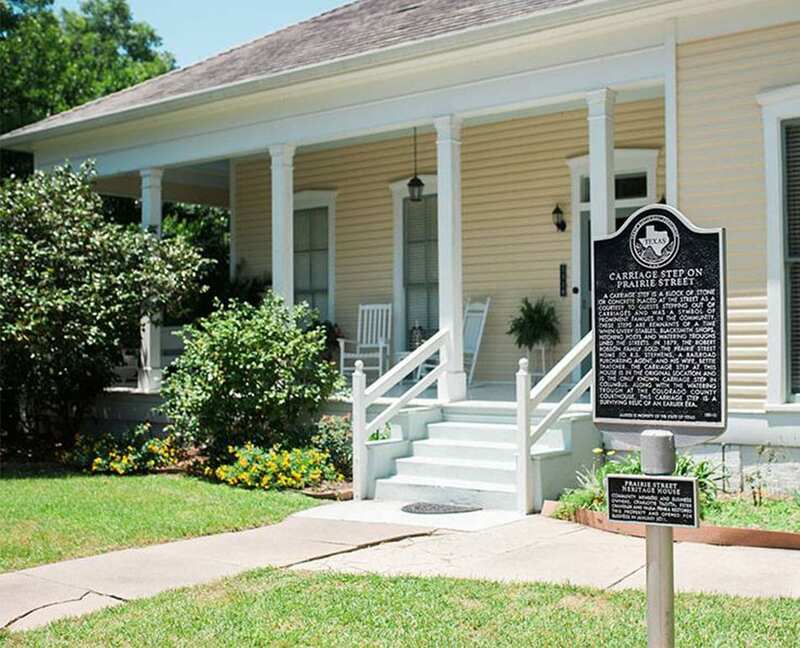 The property now serves as the Magnolia Oaks Bed & Breakfast. The Mewes-Gant house was built in nearby Alleyton by Rudolph Mewes (pronounced “Mavis”). In 1978 it was purchased by the Gant family, moved to Columbus, and restored by preservationist Laura Ann Rau. The original German stenciling can still be seen on the walls. 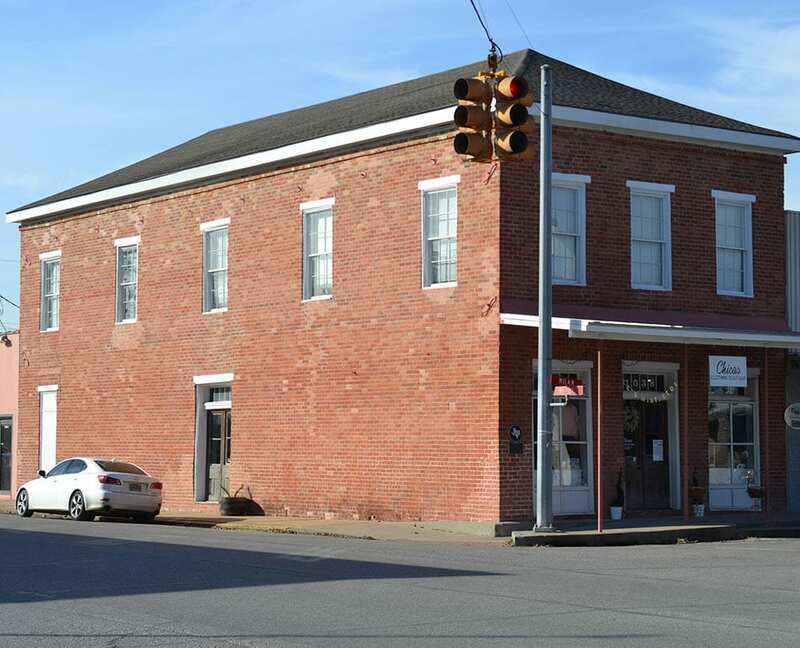 Built in 1850, this building is the oldest brick building in Columbus. It was owned and occupied by Thomas A. Harris, a local physician, from 1850 to 1867. From 1912 to 1979 the Fehrenkamp family operated it as a grocery store. Dr. Charles Tait was a surgeon, surveyor, Texas legislator, and owned a large plantation south of Columbus. 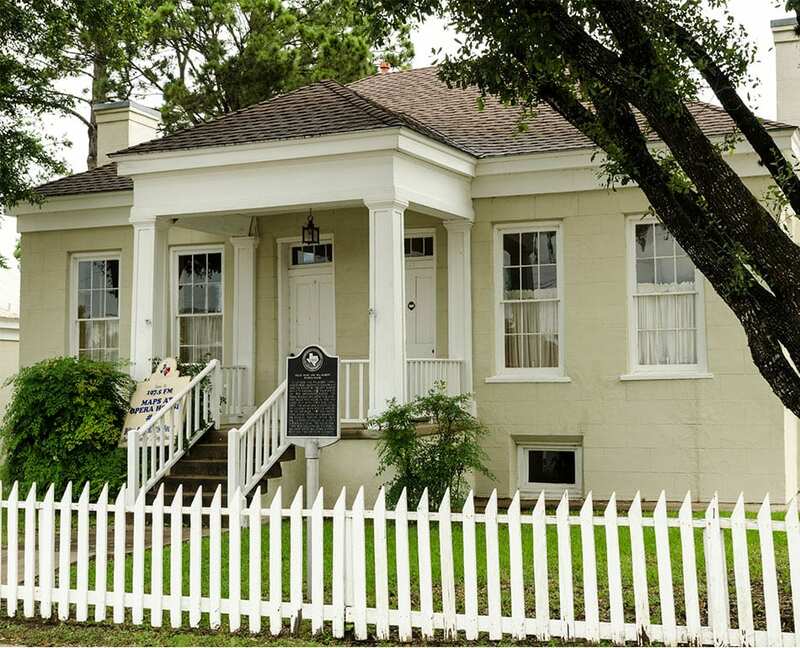 He began building his Greek Revival town home in 1856. 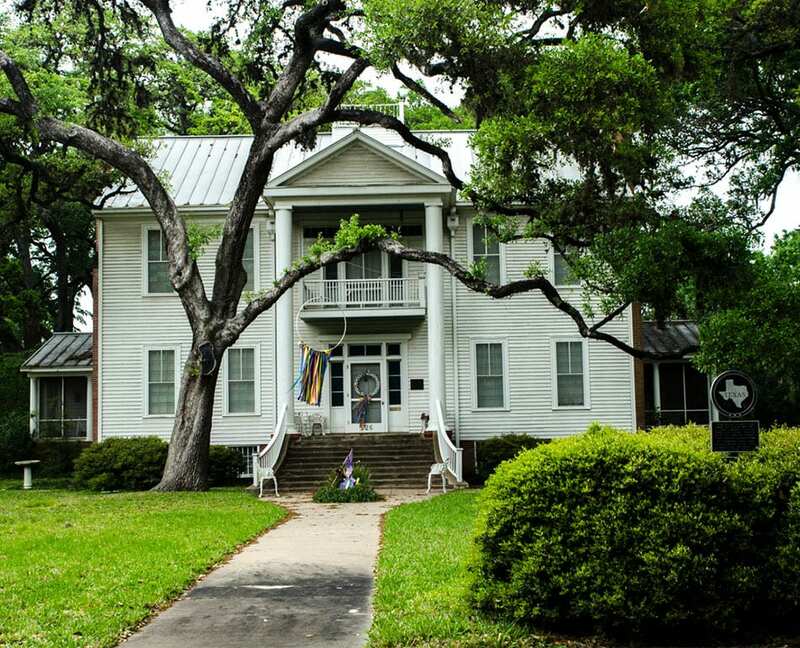 His family moved into the home in 1859 but it wasn’t finished until 1860, after he completed his military duty in the Confederate Army’s 4th Texas Calvary. The bricks of the home were made on the Tait plantation and the stone for the home’s foundation was quarried from the plantation as well. The anchor from the Moccasin Belle, the boat that carried Tait’s cotton to Galveston for resale, rests in the front yard.